Narragansett Bay, Mashapaug Pond...these local New England waterways recall engineering reclamation projects, summer recreation and a particular kind of environmental thought around water. But they have another history, too, one in which is folded the lives and knowledge of the First Peoples of the region, of the Eastern Woodland nations, who have a deep connection with both the land and water. Beginning with a short introduction tracing some considerations about Narragansett Bay in the literature of colonial science and settler histories, this talk will recount historic and contemporary uses of fresh water and the ocean bays, aesthetic and spiritual meanings of those waters, and the impacts of colonization, industrialization and urbanization on all these, through indigenous eyes. The journey will take us from Providence...to Bermuda, and back. 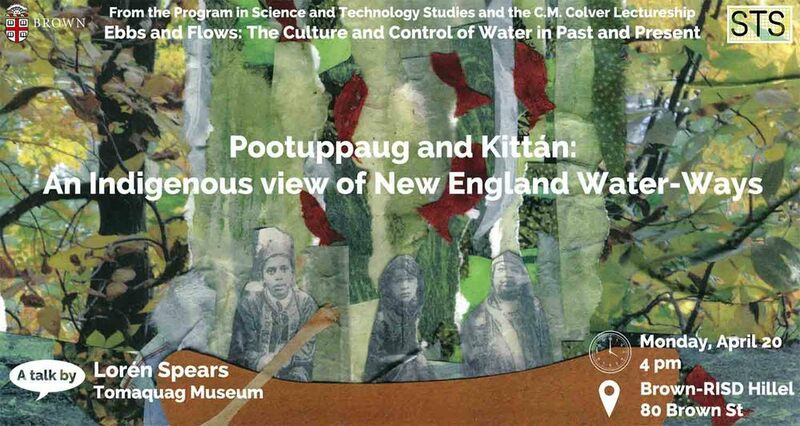 "Pootuppaug and Kittán: An Indigenous view of New England Water-Ways" is the 4th in a lecture series. introduced by Geri Augusto, and presented by Lorén Spears, Executive Director of the Tomaquag Museum in Exeter Rhode Island. "Ebbs and Flows: The Culture and Control of Water in Past and Present", features four talks taking up STS approaches to water. This series is sponsored by the Program in Science and Technology Studies and the C.M. Colver Lectureship.